200 Generals, Admirals and high ranking officials call on the Congress to stop the Obama administration from making Iran a more dangerous nation. 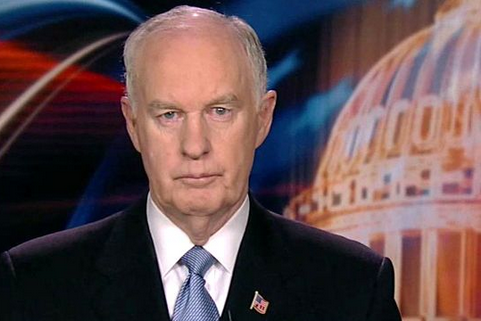 Retired General McInerney warn that the deal with Iran will permitt the Ayatollah to get a nuclear bomb. “What I don’t like about this is the number one leading radical Islamic group in the world is the Iranians,” retired General McInerney said. You do not have to be a general to understand the threat that Iran poses to the civilized world. You just have to listen to the message coming from the priestly class that govern this totalitarian Islamic republic. “Death to Israel, death to America”. When Obama wants to release 100 billion USD in support of this regime, he is obviously a traitor, a part of a fifth column that rule in Washingtom D.C.
Not to stop Obama will be a betrayal. Not only of Israel. But also a betrayal of the American and Western European way of life. ‘“Because they lead my people astray, saying, ‘Peace’, when there is no peace, and because, when a flimsy wall is built, they cover it with whitewash. In the Messianic perspective, we will enter an age of massive global betrayal. The coming of the rule of the last and final antichrist can not be avoided. We just have to live through it, as we await the return of the savior of the World, Jesus of Nazareth. Be wise. Do not support those who whitewash the crimes of the Ayatollah, and even support this Iranian regime. All I can say is the military officers should remember their oath of office! When they do the path is very clear. It is neither based on logic, nor by reason to gift 100 billion USD to Islamic priests who shout “Death to Israel, death to America”. It can only be done, if you expect good return on this cash, by doing business with the Iranians. Obama has also got a promise from Iran, that the Ayatollah will fight for the American control over the oil fields in Northern Iraq. Now contested by ISIL. Paramilitary troops from Iran tries to get back the oilfields around Mosul, to Uncle Sam. The message is: “To Hell with feedom and democracy, as long as we get the cash flowing into our accounts”. The Messiah said you can not serve God and mamon. We have to make up our mind and be wise. It is amazing to watch prophecy being fulfilled before our very eyes. The governments of this world working together to establish peace. Peace that will not last. Keep watching for the deal to be made. Then the real trouble will start. Editors comment: Your link was removed. No external links are permitted on this site. DESTROYING SOCIETY AT THE FOREFRONT WITH OUR PEOPLE. FAVOR , A POWER OF GREED TO BUILD MORE WEALTH. TERRORISTS OF OUR SOCIETY NEED TO BE STOPPED . BLIND AND IGNORANT FOR ANY KIND OF REAL JUSTICE. ABE ARRIGOTTI OF – SIERRA CORPORATE MANAGEMENT :320 n. PARK VISTA ST.
FOR THE PARK WHO OPERATE UNLICENSED . MORE ABOUT THIS GROUP WILL POST LATER .